Luckily for me, messy hair is in. I have super thick, really wavy hair. Currently it’s also ombré-ed which makes a top knot super cool looking. Top knots: flip your head over and twist all your hair together into one long piece. Stand up and curl it up into a bun on top of your hair and put a hair tie around it. 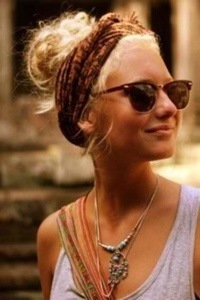 For extra style, pin the bun in place instead of using an elastic. Or use a sparkly tie. 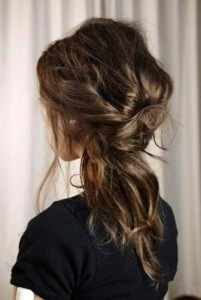 You can also pull a hair loose from the bun to braid around for a boho finish. Dry shampoo: Oscar Blandi makes an incredible dry shampoo that you can buy at Sephora for around $20. Shake it into the roots and blend in with our fingers. Blow drying it may also help hide the shampoo. It is a miracle worker and will soak up any oil. For a lot of these bed head looks, it is much better to have second day hair with dry shampoo than straight clean hair. I’ve also found spraying in some kind of salt water will give you more waves and volume which are also prime for these bed head looks. Bobby pins are staple and vital. So are cute hair ties. This entry was posted in fashion and tagged fashion, Hair, hair help, messy, style, top knot, volume. Bookmark the permalink.